This year for Father's Day, Michael won't be home since he's deployed. After looking at Pinterest for Father's Day ideas, I came across this post that talks about sending your child's hand print with a poem to the deployed parent. I really liked this idea, and my daughter loves to make hand prints, so I got out some paint and colored her hand green (she loves paint too). Then I made her hand print on card stock. I wrote my own poem and put it on the back of her hand print. Once everything was dry, I just laminated it and put it in an envelope with another painting she did for her daddy for Father's Day. We made this project early so we'd have time to mail it out and get it to him by Father's Day. We have to live apart. Just hold my hand to your heart. 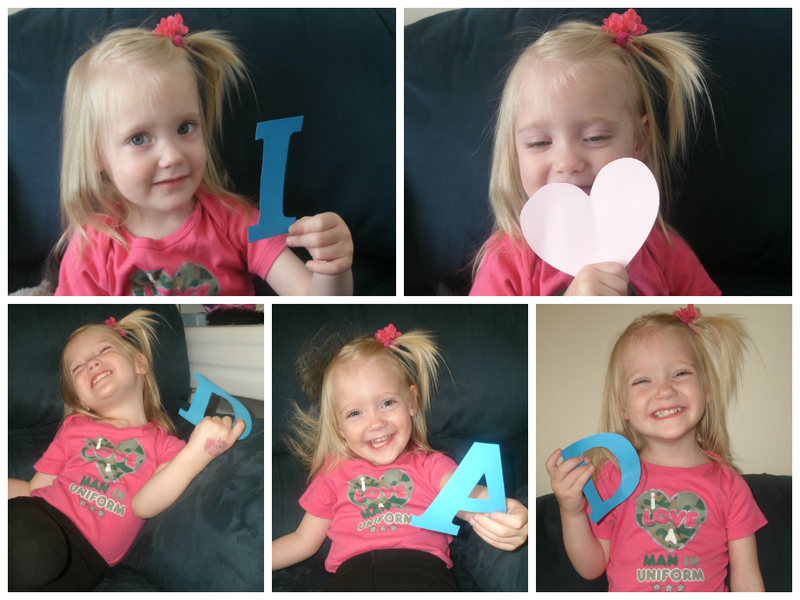 On actual Father's Day, I took a bunch of pictures of my daughter and made a collage. I know her Daddy loves it. We did a few other crafts too to celebrate Father's Day.